Like many divers (and most underwater photographers), for most of my life I have wanted to dive the fabled Lembeh Strait. Nancy and I decided to do it at the new year. Our trip took us to three distinct locales in Indonesia and we dove two of them. We got back a few days ago; The Photo Tourist will be in Indonesia for some posts to come. I would guess that most people interested in fish or underwater photography have seen mandarinfish (the mandarin dragonet). The photos are common and the fish are popular in saltwater aquariums (though these beautiful, docile fish usually die quickly in small aquariums). 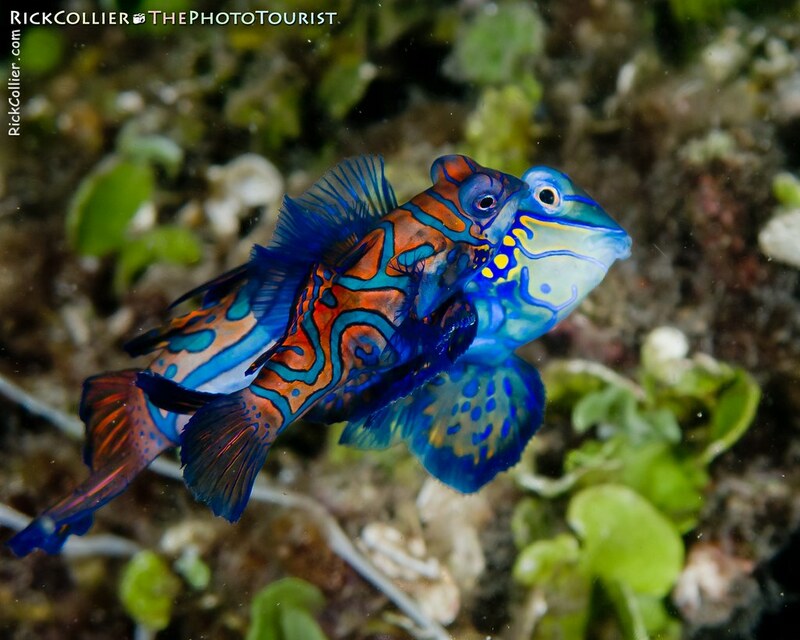 I have always wanted to photograph mandarinfish in the wild. 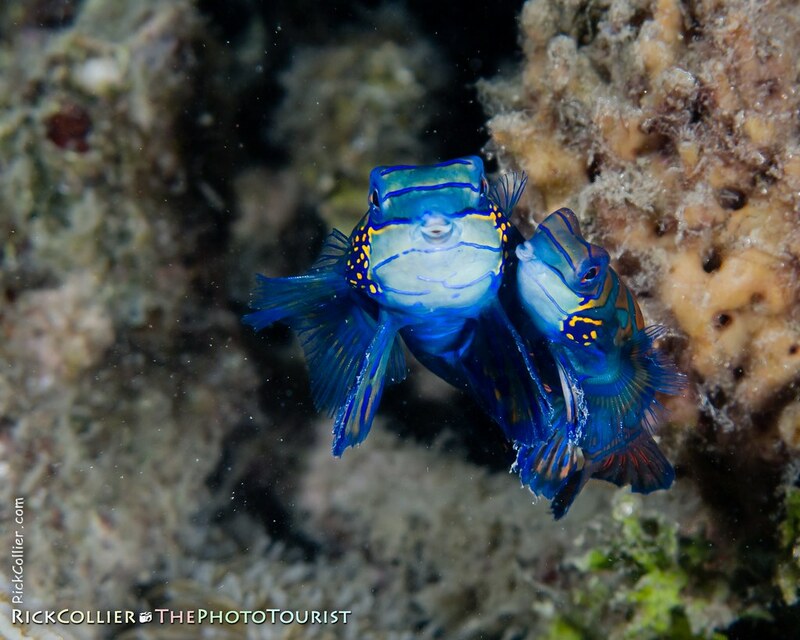 I got my chance at the terrific Lembeh Resort, on a house reef where these little fish are common and their appearance is as predictable as the sunset. After a two-minute boat ride to the spot, we dropped into about 15 feet of water. It was dim but still light enough to see and for cameras to focus without lights as we settled in to wait for the fish. We tried to be still and soon there were mandarinfish all around us in the rubble bottom. The fish gradually formed small groupings: two or five males milling around a small area were eventually joined by a slightly larger female. If the female stayed near the males, the dance show would start soon after. Without any obvious sign, a male joined the female cheek-to-cheek. The two would then swim in a spiral, gradually rising off the bottom. After 30 seconds or a minute (maybe six inches of vertical travel), the dance was complete: With a puff of eggs and sperm, the two separated and darted back down to the rubble bottom. A minute or two later, the dance would repeat. We stayed until it was fully dark and the cameras would not focus. With memory cards full, we took our leave of the mandarinfish dance club and headed back to the boat for warm tea; Dinner was waiting back at the resort. This entry was posted on Monday, January 31st, 2011 at 11:27 am. It is filed under thePhotoTourist and tagged with coupling, diving, Indonesia, Lembeh, Lembeh Resort, Lembeh Strait, mandarin, mandarin dragonet, mandarin fish, mandarinfish, mate, mating, mating dance, North Sulawesi, pairing, photo, Photo Tourist, PhotoTourist, scuba, the Photo Tourist, thePhotoTourist, tourism, tourist, Underwater. You can follow any responses to this entry through the RSS 2.0 feed.